A note in my sketchbook. I'm re-reading Original Blessing by Matthew Fox and his ideas on Creation Spirituality. It's premise is basically that the earth was made originally good and the fall/redemption ideology has distorted the concept of the Divine creative energy that God imbued in creation. It is quite a liberal theology but I love it. I'd like to expand on it more here at some stage but I don't really was to just repeat large chunks of the books here. I'd love to study it further as it does actually want to make me take a deeper look at the Bible, but getting my head around deep theology isn't easy. It is hard for us to understand the entirety of the created cosmos. I am not a creationist (literal 7 days to create the earth) and quite happy with idea that the earth has been around for millions of years quietly getting on with the process of creation. Hmm, perhaps Creation is a better word for Evolution as I am not sure that the latter fully encompasses the entirely process of Earth's development. From that perspective the recent Christocentric time frame within we seem to place much of our history and development seems almost inconsequential. If God's creative energy has been at work for so long in forming the earth that nourishes plant roots, the butterflies that dance in summer sunshine and clouds that bring rain to the mountain streams; then are we humans not the most arrogant, self-centered and destructive life forms to walk upon this fragile land? 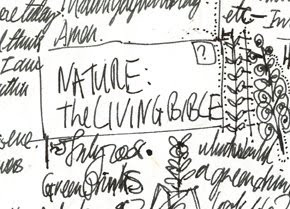 Can Nature be my Living Bible? How can I enter a truly authentic mystical faith that draws up nature and Creation for its Being? And, possibly more interestingly, how can I find people that share similar ideas? The internet is fine as a starting point but it lacks proper personal contact. I am not sure I am ready to return to our church yet so I do feel a bit isolated. Perhaps i should start a group... or do something... or just scream with frustration! Sorry to hear about your solo journey. I used to feel the same way, at one point I even returned to church, but only once. I realized when I was there, I didn't believe it anymore. Solitary spirituality is fulfilling, but it is a hard road. I have really been there. I am so happy right now where I'm at though, because I don't question anymore. You will find your way, whether it be back at church, or somewhere else. The questing can seem frustrating, but it gets us there in the end, and you learn so much from it. I hope you find others you can talk with in your area. I remember that was the hardest part on my journey, feeling alone.